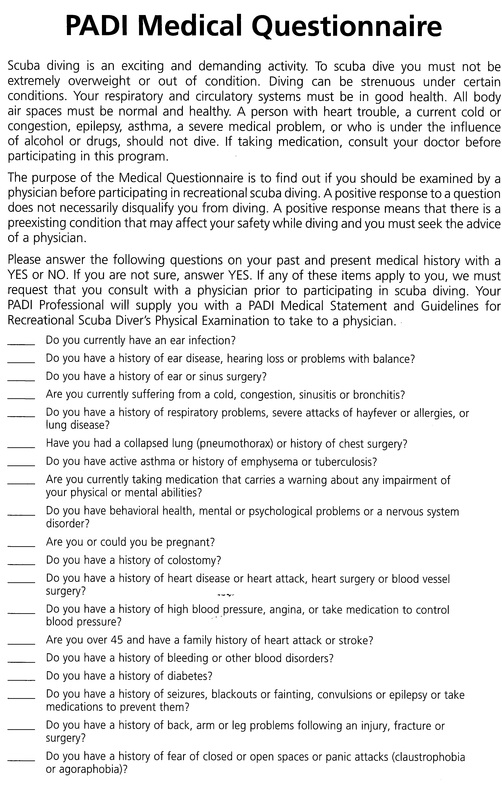 Whilst our dive experiences are open to anyone, we do recommend that before purchasing your voucher you read through the following Medical Questionnaire. All customers are required to complete a PADI medical form in advance of their dive. If you answer YES to any of the questions below, or are unsure of your answer to any of these questions then you must seek authorisation from your Doctor to dive. Please click the link to obtain a full version of the Medical questionnaire. PLEASE NOTE: Once a voucher has been purchased, you must then book a dive slot. Please call the aquarium on 01383 411880 to book your slot. We recommend booking at least eight weeks in advance. Gift vouchers purchased online will receive a PDF version of the Shark Dive Voucher as an email attachment. Please check that your Junk mail / Spam filter will allow this. ☇ Can I feed the sharks? ☇ Can I fly after I dive? PADI recommends that you wait a minimum of 12 hours after you dive before you fly. ☇ How do I get there? ☇ Am I in a cage? ☇ Can my dive club come as a group? ☇ Can my friends watch me dive? Yes. Dive spectators are more than welcome to watch from a tunnel and receive a discounted entry rate to the aquarium. The number of spectators coming along needs to be confirmed in advance. ☇ What do I need to wear? At Deep Sea World we dive in dry suits and SCUBA gear. Please bring a change of warm clothes with you on the day of your dive to wear under your dry suit. Tracksuit bottoms, long sleeved t-shirts and warm socks are perfect. ☇ What are the height and weight restrictions? If you answer ‘YES’ to any of the questions on the medical form, you will require a doctors permission to dive. If all of your answers are ‘NO’, please just come along – you will fill out a form when you get to the aquarium on the day of your dive. Please note: Refund is available only on medical form basis.